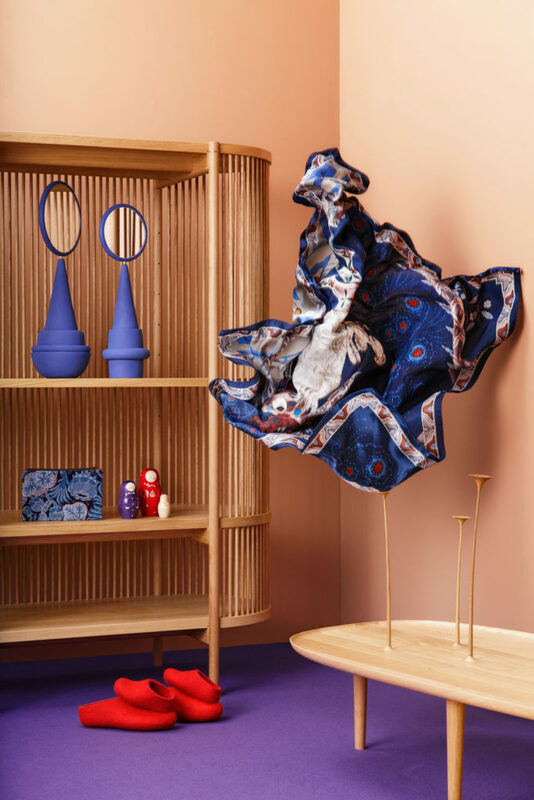 Designer Tero Kuitunen is inspired by the interface of design and art, the unprejudiced apposition of things, floating sceneries, and the meaning of humor and touch in design. Alongside product design, Tero is known for concept and space planning as well as memorable projects of contemporary art and design. 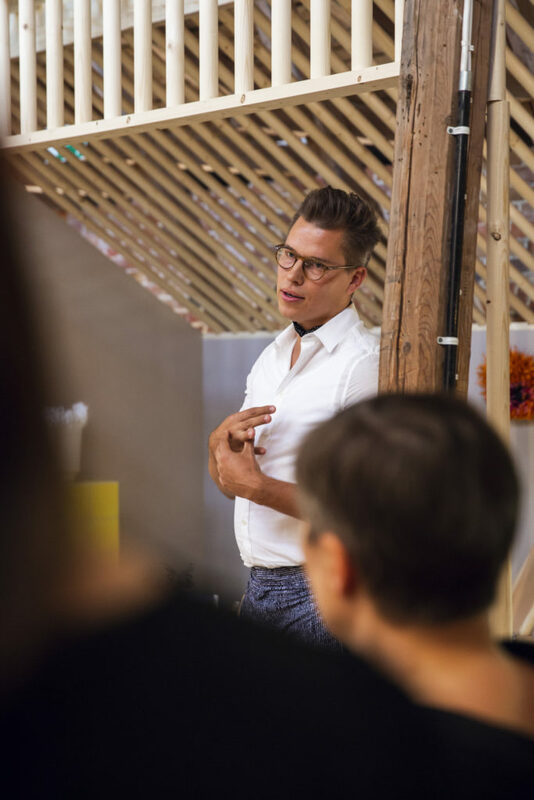 Tero’s projects include an exhibition in 2017 co-created with Karoliina Hellberg and Raimo Saarinen called Keskeneräiset utopiat (“Unfinished utopias”), which was executed in Kotka in the pulp mill area Sunila designed by Alvar Aalto, and a room in last summer’s Fiskars Summer House exhibition in cooperation with the furniture company Hakola, inspired by the art of Rauha Mäkilä. In 2018 Kuitunen was a nominee for the AD Awards. He is preparing himself for spring’s Milan Salon Satellite and curating a design exhibition during autumn’s Vienna Design Week. Tero Kuitunen, photo by Maija Astikainen. The fading of the boundaries between visual arts, design and spatial thinking can be seen in your work as a designer. 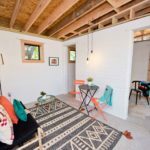 Where does your interest in these kinds of projects come from? In different periods, surely, my emphases have been various, but even during my studies I was interested in encounters between design and visual arts. I have been thinking about where I fit in this. I identify myself as a designer, but visual arts also interest me as a form of making. The products I design have more to them than just functionality. There is a deeper meaning to the making. Someone once said that there is something poetic in my design products – that’s a beautiful thought. Combining these worlds deeply interests me. It is easy to think that the design starts from an assignment; it is often described as creative problem solving. I think it’s also a delicious and interesting thought to just start working without any preset function. Certainly that Sunila project was a natural project within which to combine architecture, design and art. It felt very functional. I’ve carried out similar projects working in the interface of design and art before, for example with Andbros we executed an exhibition called One Off, which was based on that meeting point between art and design. 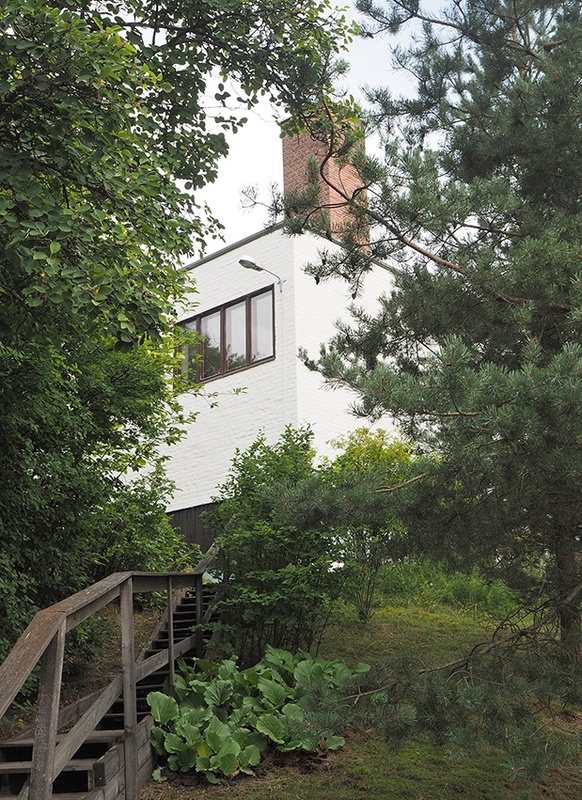 Kantola by Alvar Aalto in Sunila, Kotka. Photo by Gerard Cabarrocas Serra. The exhibition Keskeneräiset utopiat, executed at the Sunila’s director’s house Kantola, was built on interesting traditions. On the other hand, the project was also very personal as it relates to the sceneries and memories of your childhood. I think personality is crucial: people love stories, they are easier to grasp. Of course it was meaningful that I had a personal connection to that area. Even though I moved away when I was relatively young, the connection to Kotka is always there. The Keskeneräiset Utopiat exhibition was a combination of various makers: Raimo as a sculptor, Karoliina as an painter and I as a designer, and of course the tradition of Alvar Aalto. I believe that when you bravely combine different things, it may become something interesting. This is an approach I exploit in my design work. By bringing your past together, you can create something new and intriguing. Karoliina Hellberg’s painting at Kantola. Photo by Gerard Cabarrocas Serra. Raimo Saarinen’s Paradise birds at Kantola. Photo by Gerard Cabarrocas Serra. In my design work I often want to take some things from the past, it can be a vibe or a memory. 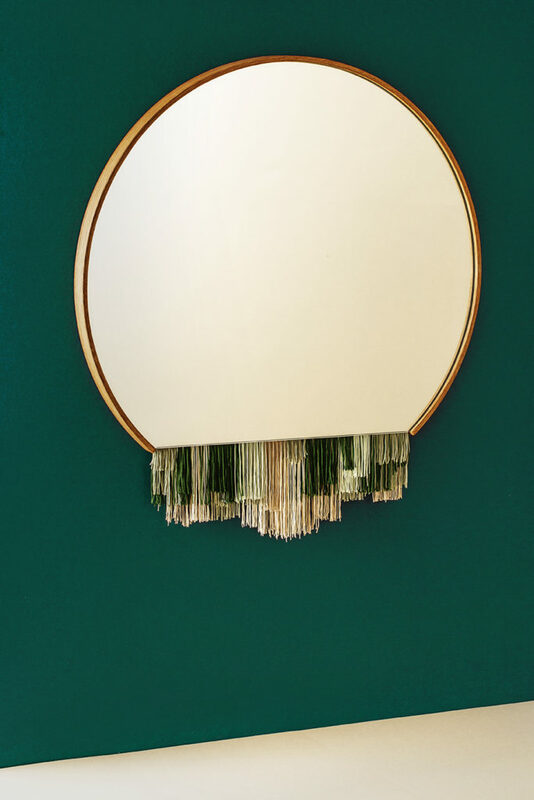 For example the Fringe mirror, a dated thing that reminds me of my grandmother’s home, or a detail from 20s flapper outfits – those are small excerpts from the past. It doesn’t have to be emphasized, just to be there, like at the Sunila exhibition. Tero Kuitunen, Fringe mirror, photo by Maija Astikainen. You can easily find the features of the traditions we carry with us, such as the meaning of nature, right? Nature is always somehow present, and from it comes the tradition of manual work. As bark boats, clothes, everything used to be made by hand … that also relates to the theme of touch which I have examined in my work. It is related to humanity, mistakes, cracks that are not present in the products produced mechanically. These arise as a bit of a ‘new theme’, even though it has always been done. I myself want to also emphasize other aspects of design in addition to practicality, such as aesthetics. Design is more than just industrial production. It can bring joy to everyday life. It can be beautiful as an object; it can be more on the side of art, not just functional. 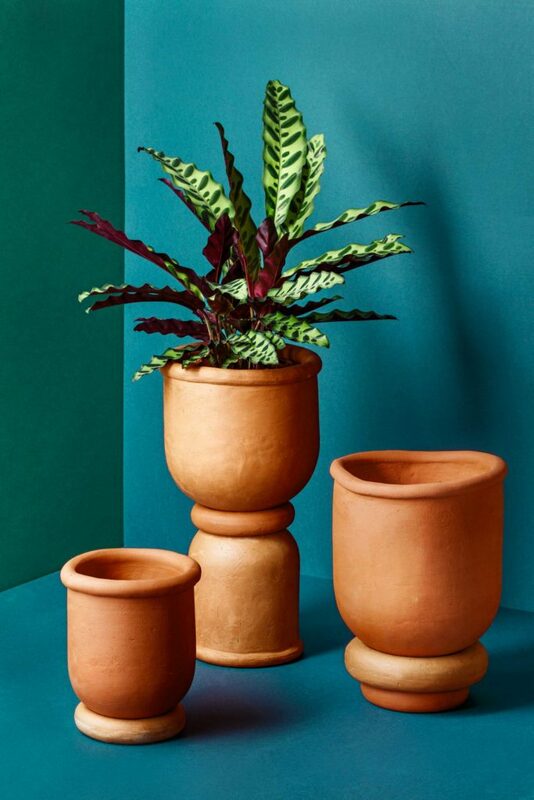 As a designer I’m also interested in producing products on a small scale, to create something unique and handmade in addition to a perfect mass-produced product. 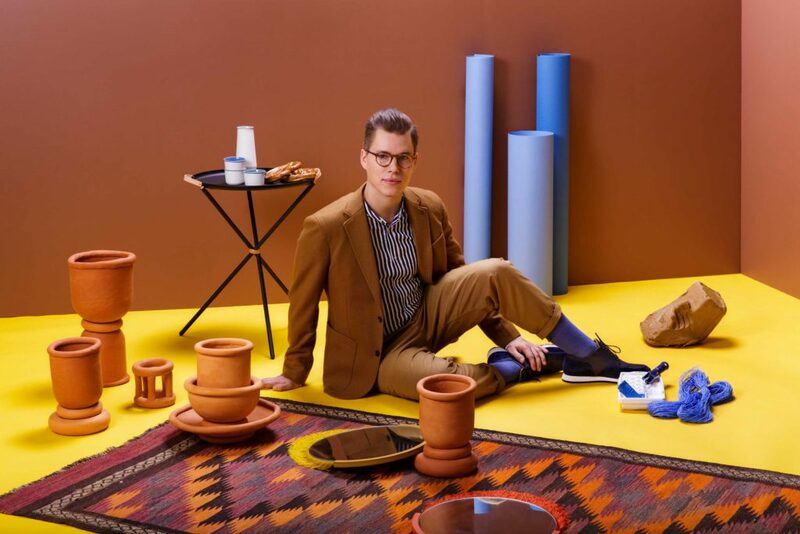 Tero Kuitunen, Mix and Max vases, photo by Maija Astikainen. What is the meaning of making together and dialogue? It’s absolutely amazing to be able to share your thoughts with colleagues in the workroom. Occasionally we make lunch and talk about our projects. It would be a totally different thing to be alone. It’s important to get feedback from colleagues. For example, when I was working on the exhibition with Karoliina and Raimo, I got a profusion of new thoughts. Together we also pondered a variety of issues from the start, and we supported each other. And occasionally you have to ask whether you are going insane, whether there is any sense in something. It’s interesting, however, how there are differences in the worlds of art and design, how other artists experience something completely differently. Your own mind is being molded. I’m thankful that I’m able to do different projects, including different commercial ones; all of these challenge you differently. At the opening reception of Fiskars Summer House. Photo by Kerttu Penttilä. In Sunila you took on the roles of, for example, designer, curator and producer; you wore many hats… What do these various roles give you when doing different projects? It’s really eye-opening, at Andbros I used to work in a role which was completely commercial design; you learnt a lot from that role. I feel like in that I’m a sort of a melting pot; it is not as black and white as my own work is. My bachelor’s degree in a ceramic and glass training program which emphasized making by hand and then later the world of master’s studies in applied arts where we worked more with concepts and ideas. Often when I think about processes, I rarely draw them on paper; I think and design in my head and sort of model it and also consider which space it could be in. Where could it link to? For example the set I presented in Sunila came out of the things that had stuck with me from my trips to Paris and Beirut. The complexity of the ideas as they concretize in your work is fascinating. How different things are when combined together. How materiality and space also accompany the thought process, and how the elements of functionality and aestheticism intertwine with each other. I feel that my process comes closer to a path that resembles an artistic process. It originates from my own experiences; there’s a message and a thought that are not always so clear. There has been a long process of thoughts in order to end up with a certain object, in which I have collected small things along the way. We have talked a lot about the exhibition in Sunila where the central basis was space and place. Last summer you were part of Fiskar’s Kesäkoti project, in which place played a significant role. That was also quite an interesting project. 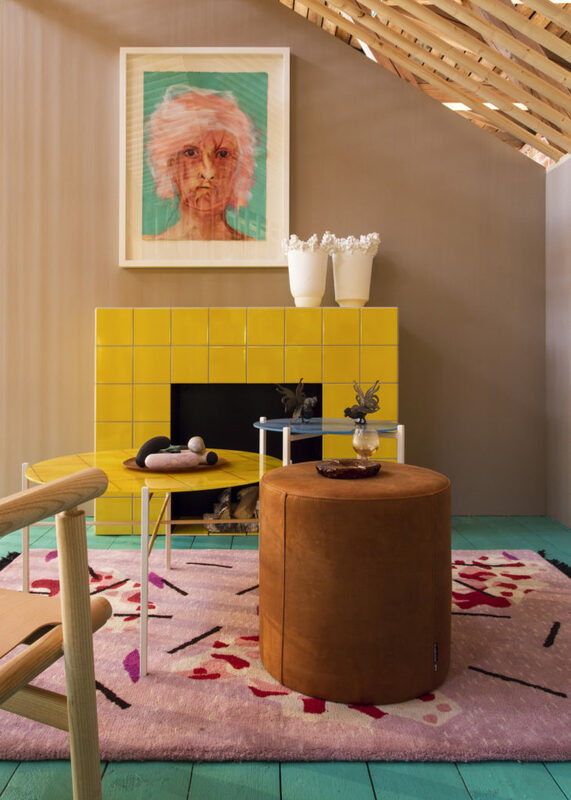 In our part, which was the Takkahuone (Fireplace room), I was the designer, and I cooperated with the furniture company Hakola, with inspiration by the artist Rauha Mäkilä, to build the space into a world of its own. That kind of a space is meant for ‘taking it easy’; it kind of suggests a French boudoir. Works by Rauha were the inspiration for the space, and the idea was to make the space for her. I tried to find confluences, really trying to grasp Rauha’s way of thinking. We wanted a strong feeling and intense atmosphere in the space. 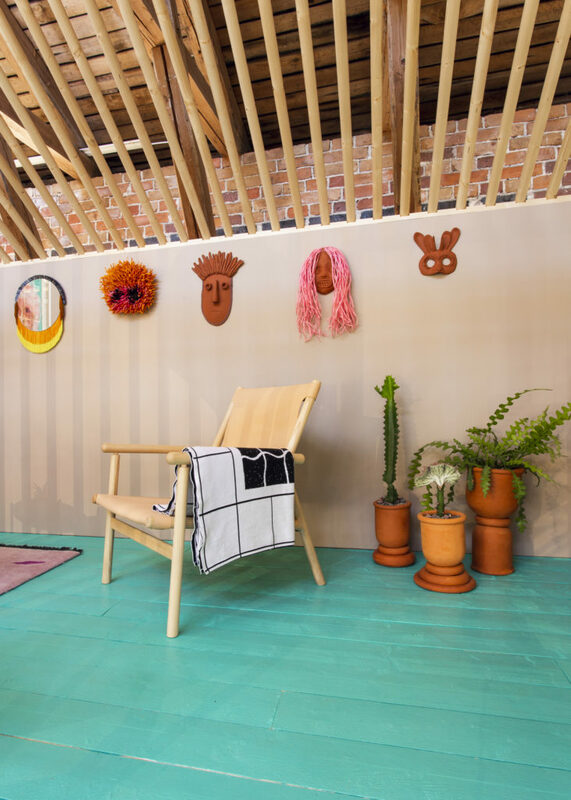 Hakola’s Noma chair was launched then and pieces of the puzzle started to click, associations with an African atmosphere started to come. 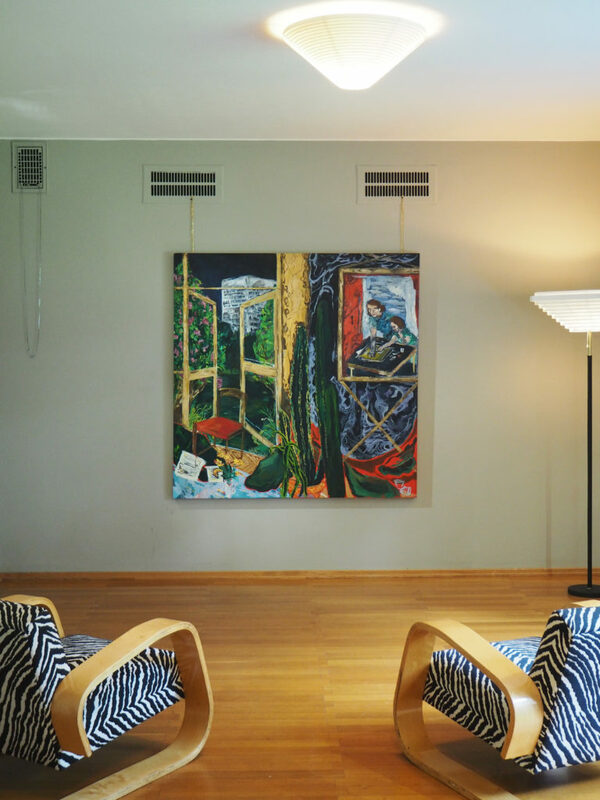 The thought of a safari had been in my mind since quite the beginning because of Hakola’s chair, and the elements in my work linked very quickly with the work of Rauha. For example, two masks that were on the wall of the space have gotten inspiration from the masks in Rauha’s paintings. Rauha’s painting on display there portrays a strong person who operated as the soul of the space, a bit like a collector’s own portrait. Fiskars Summer house, artwork by Rauha Mäkilä. Photo by Kerttu Penttilä. Masks on the wall and the vases are by Tero Kuitunen. Noma chair is by Hakola. Photo by Kerttu Penttilä. Just like the Healing table which you designed, doesn’t it change the essence of the space, doesn’t it have a strong charge to it? I want to draw questions and joy out of people, even aha moments or confusion. That is the way to make a connection with the viewer. It’s surely connected to the theme of touch, for all my works you feel like touching them, the materials call to be touched. I have been thinking that for objects with a strong charge, the touch is more spiritual than physical. It’s also the same with different religious artefacts, objects such as beads; their meaning is to connect with something deeper. It’s terribly interesting that design works as a tool to reach ‘somewhere else’. Something more meaningful than just feeling good and looking nice. The object is in the middle of ‘the event’. Just like a cross, it’s a designed object with a strong charge. When ‘cut’, at the end it’s like a sculpture, just with a strong agreed symbolic value. Tero Kuitunen, Healing table. Photo by Maija Astikainen. Do different kinds of exhibition projects also seem to highlight your work as a designer? 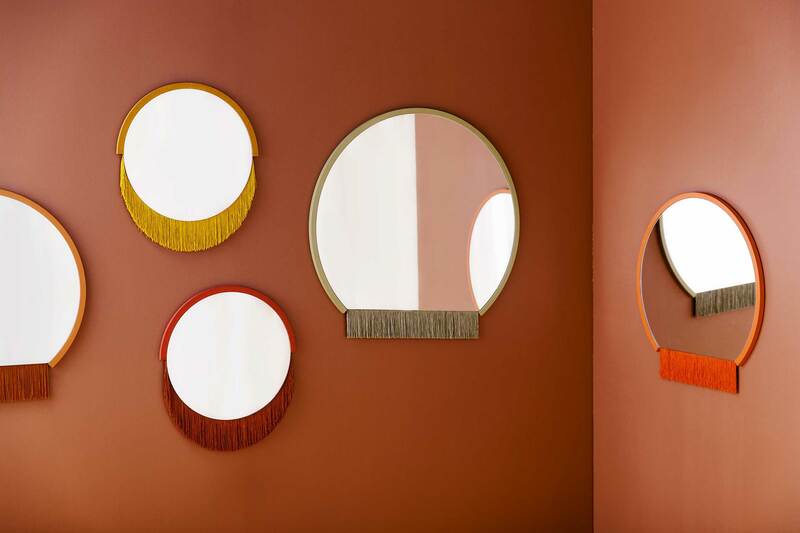 Absolutely, for example for Kotka I made a Fringe mirror, which I then modified into a more commercial version for Milan. There are the unique versions with a self-bent body and the more commercial version made afterwards. When you are able to make different kinds of projects at the same time, it enriches your own thinking and making. It’s also interesting to realize how the themes and techniques I use resurface in different situations and at different times. Such as the Micros & Cosmos trays, where a controlled coincidence will determine the end result. I work with the object to some point, but I let the final result be molded on its own. Tero Kuitunen, Micros & Cosmos tray at Kantola, Sunila. Photo by Gerard Cabarrocas Serra. When you do different things at the same time, things get combined and intertwine with things done before. I don’t do much analyzing at a certain point; I work strongly based on intuition. Often a starting point can be based on a thought that has been forming over a long time. In a way, ideas grow in a ‘churning lump’ where something pops up and then crystalizes or joins together with something else. When you start to analyze, you realize that this is a theme that has been with you for some time. 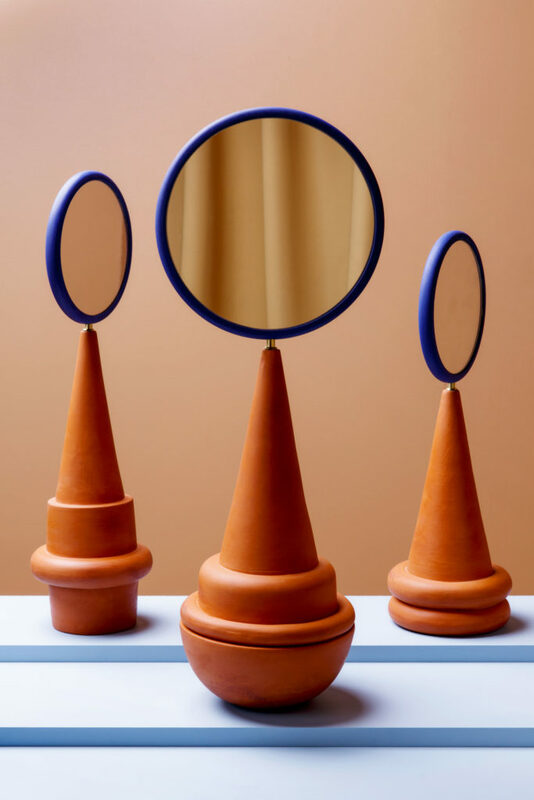 Tero Kuitunen, new Marrakesh mirrors will be soon seen in Milan. Photo by Maija Astikainen. Last autumn you were in Tokyo for the exhibition and ensemble event called Tauko, which was organized by the Japan Finland Design Association. The exhibition was held in °C Sleep + Sauna and it dealt with the meanings of sauna. In your part of the show you took on the theme of touch. A break from digitality was my starting point. This evolved from the theme of touch, which has interested me very much lately. We are so attached to our own mobile phones that also in our brains there is a transformed area which has a straight contact to the forefinger. We need some kind of counterbalance to the daily life of digitality. Originally the hands’ purpose was to do things, they are our tools. It’s interesting what different meanings touch has, for example, with respect to a break from digitality. The sauna is a place where we don’t take mobile phones; it has still retains its sanctity. It’s a place where you go to meet people as equals. Wild at Heart exhibition will be held in Vienna next September, curated by Tero Kuitunen. Designers included i.e. Antrei Hartikainen, Klaus Haapaniemi, Com-pany: Aamu Song & Johan Olin, Eero Aarnio, Teemu Salonen and Sofia Okkonen. Photo by Maija Astikainen. Your role as a curator of interesting ensembles continues with more and more interesting projects. 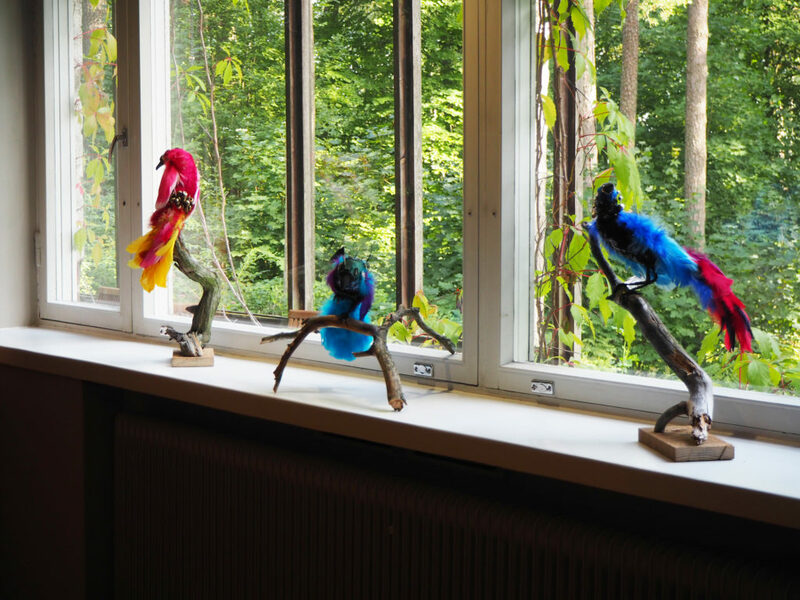 Next you will be curating the exhibition Wild at Heart during Vienna Design Week in September. 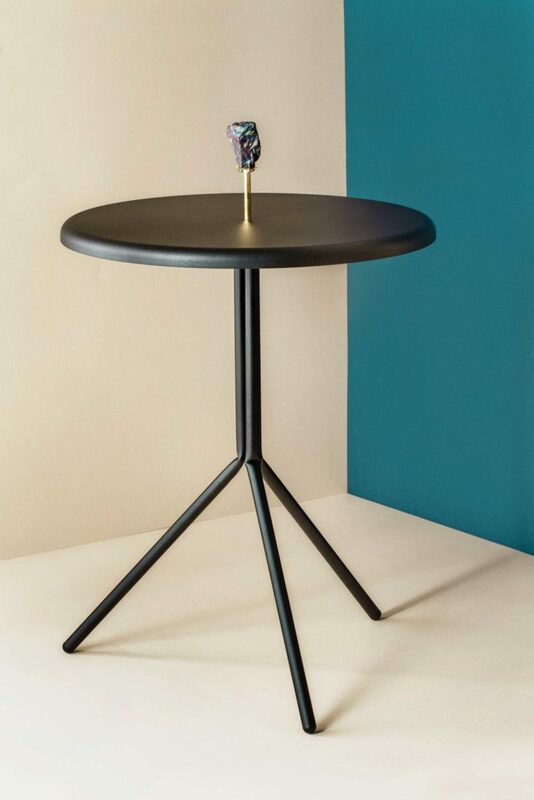 You will introduce Finnish contemporary design highlighting the meaning of humor and joy. How did building this body of work start, and what do you want to highlight from this project at this point? 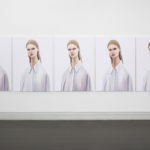 Do visual arts have a role in this collection? I was super happy when the Finnish Cultural Institute of Germany contacted me and asked if I would be interested in curating and designing a body of work that would present Finnish design. Its premiere will be at Vienna Design Week in September. This year Finland will be the theme country of the event week, so Finland will have a big role in the collection. 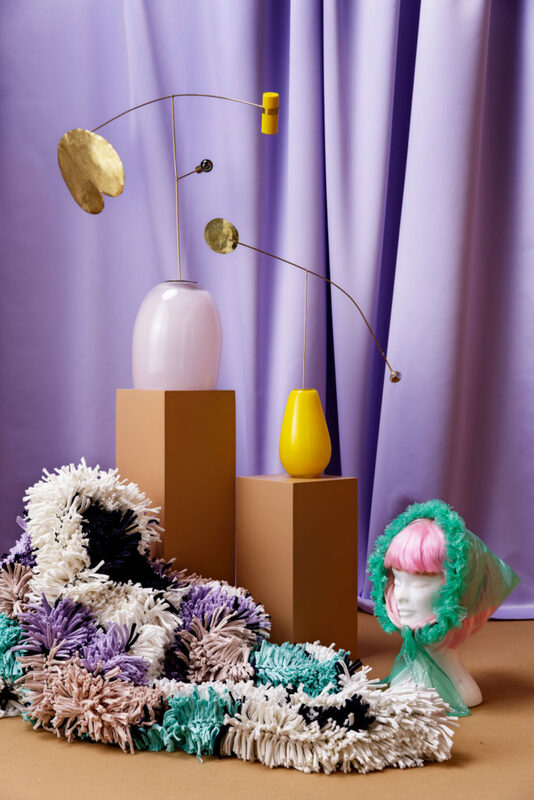 Wild at Heart exhibition will show Finnish contemporary designers and artists, among others Milla Vaahtera, Ragmate and Tuuli-Tytti Koivula. Photo by Maija Astikainen. The exhibition Wild at Heart will have a central part in the official program, too. After Vienna, the exhibition is intended to go to Budapest, Stockholm and Tokyo with the help of local cultural institutes. In the exhibition I especially want to highlight younger current design and art. 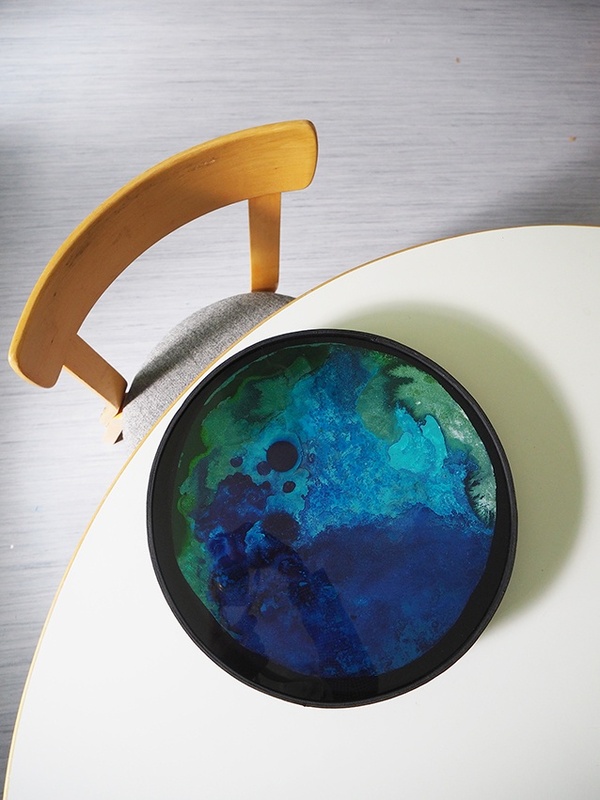 I have curated along 10 makers from different sectors of design and art. Included in the selection are especially creatives whose work combines art and design with a strong visual language. The starting point was to shatter the usual and show that you can find a lot of color, humor and interesting content in Finland. I want to show that under a shy and reserved shell, you can find bold free spirits with a wild heart.